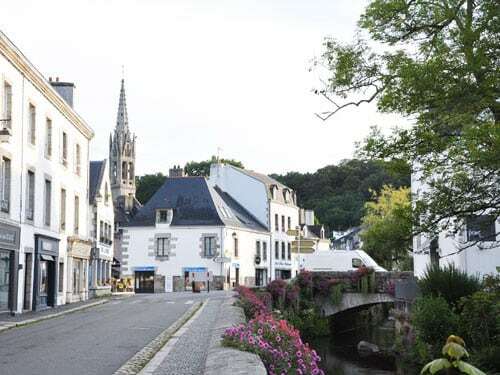 Pont-Aven is located on the bank of the Aven Estuary, where the last bridge spans the small river - aven in Breton - before it flows into the sea. The Aven’s tumultuous waters rush down the Montagnes Noires and break through the heaps of rounded boulders scattered in its bed. They turn the wheel of an old water mill, the only remaining of the 14 mills that operated in the small port in the 19th century. 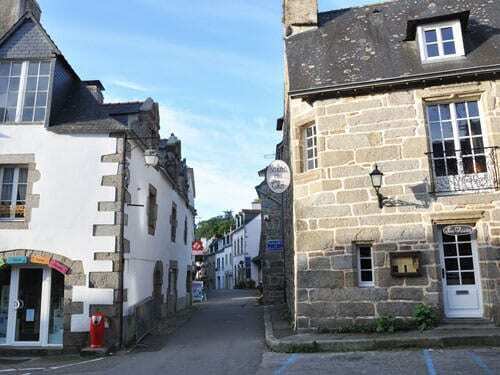 « Pont-Aven, ville de renom, 14 moulins, 15 maisons - Pont-Aven, renowned city, 14 mills, 15 houses "
As most Breton municipalities, Pont-Aven boasts a significant archaeological heritage. This includes the Allée Couverte du Moulin René, two dolmens in Coat-Luzuen, which are in fact the remains of a second neolithic burial chamber, and the Christianized Menhir of Kerangosquer. 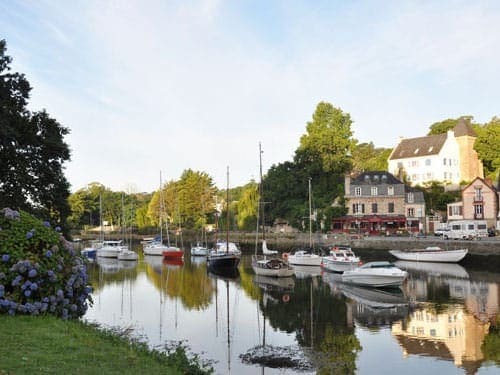 Finally, nestled in the heart of two wooded hills that shelter it from the north, and facing the sea, Pont-Aven enjoys a pleasant temperate climate. This geographical and climatic situation turn it into a renowned tourist spot. 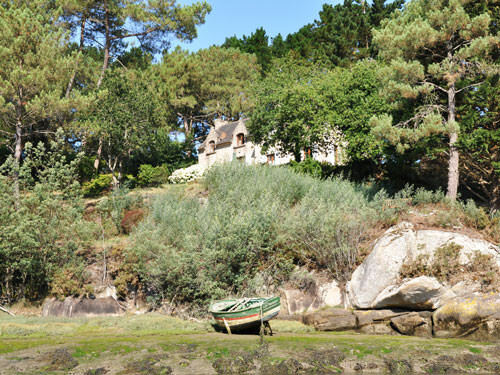 However, the notoriety of the little port began with the development of the seaside tourism in the early 19th century. But the construction of the railway line Paris - Quimper in 1863 was the real trigger. This was indeed during a rail journey that the young American painter Henry Bacon discovered Pont-Aven in 1864. Other American, English and Canadian painters in search of pastoral charm, authenticity and cheap life followed in his steps in the years that followed. Ten years later, they were already 50! More came over and formed a joyful and bohemian community of artists. 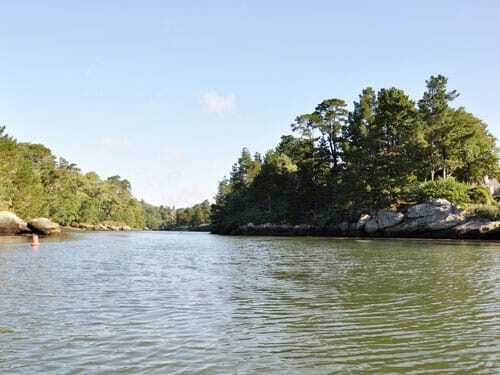 The landscapes of this untamed part of Lower Brittany were popular painting subjects. 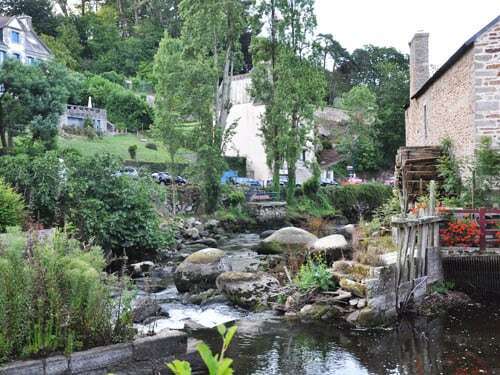 So were the inhabitants of Pont-Aven, who proudly wore their traditional costume and accepted for a small fee to pose as models. 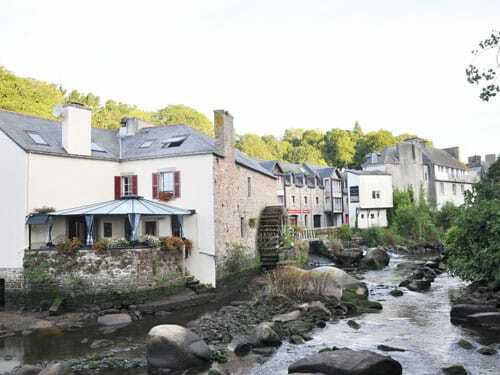 However, Pont-Aven owes its fame to Paul Gauguin, when he moved in the Auberge Gloanec in 1886. He indeed founded the famous Pont-Aven School, an artistic group that gathered independent artists. Gauguin sojourned several times in Pont-Aven, either in the Manoir de Lezaven or the Auberge Gloanec between his travels to Arles (1884) and Tahiti where he stayed in 1891/92. He returned in 1894, but left for good for the Marquesas Islands in 1895. 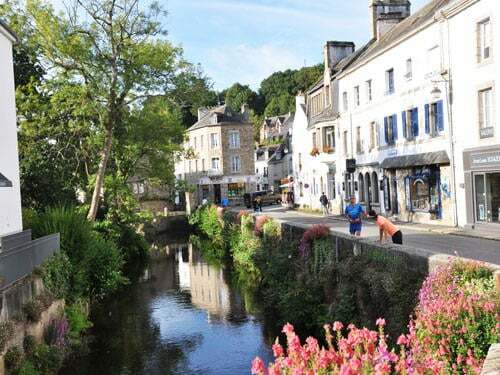 From the late 19th century to the inter-war period, Pont-Aven boasted some 40 hotels and pensions of artists that earned it the undisputed title of Cité des Artistes. You’ll discover their paintings in the local museum of fine arts, which was refurnished and considerably enlarged in 2016. 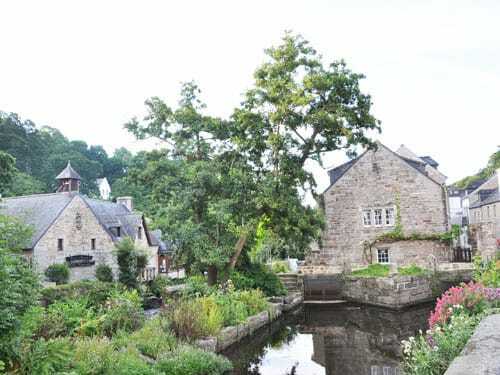 That said, Pont-Aven is not only a heaven for artists, but also a gourmet city! In 1890, Isidore Penven indeed invented the recipe for the round butter biscuits since known as Gallettes de Pont-Aven. Isodore had just taken over the family bakery, which was located near the bridge (today Boulangerie Kéraval). Legend has it that Isidore invented the recipe after a weighing error! Two local biscuit factories have today taken up the torch in the hand-made production of thick Palets and thin and crispy Galettes. The recipe is simple: flour, half-salted butter, eggs and sugar and no preservatives or additives! The Galettes weigh less than 10 grams and have a little less than 30% butter. The Palets, on the other hand, are thicker and brittle, and weigh double.